As many of you probably know, I served in the Air Force, Army, and Navy, so I have had a LOT of military training. While in the army I worked as a counterintelligence Interrogator and an Army Criminal Investigations Special Agent. The aim of any army soldier when they step onto the battlefield is to “kill and not be killed”. This is a tall order for an average person, but soldiers are not average. Most civilians take the training soldiers receive for granted but could actually learn a lot from how soldiers are trained. Soldiers manning the front lines of the battlefield are trained in army combat training. They participate in some of the most realistic, hi-tech combat training and survival role-playing activities before they are sent out to the field. For instance, the US Marines participate in programs designed by Hollywood special effects companies who use real people and special effects to recreate real-life situations. During army combat training, soldiers are put through the grinder. They are taught and expected to defend themselves in the harshest physical conditions. Rugged terrain, harsh weather, and deadly assailants are the normal conditions a soldier can expect to encounter, so they are tested on their ability to conduct raids or rescue their comrades while saving themselves from grenades, one-on-one attacks, fire, and of course gunfire. 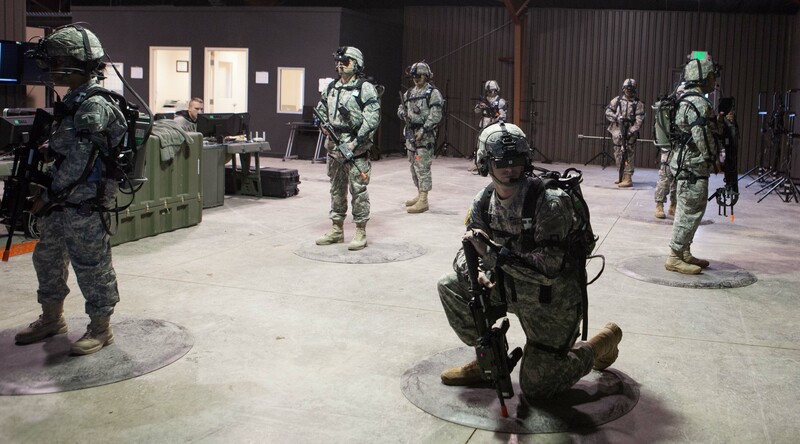 During their combat training, the soldiers are taught skills that enable them to make split-second decisions regarding how they should attack the enemy. They are also trained on how to control shock and pain — some of the biggest killers — even more so than the wound itself. These factors could distract them from achieving their main objective on the battlefield, or hold them back from performing their best on the battleground. They learn how to stay focused when facing trauma in order to achieve their main objective which is to eliminate the threat and save those who are helpless or injured. One of the main objectives of army combat training is hand to hand combat. Any trained soldier can shoot the enemy from afar, but if they are in a situation where they have to be face to face with one opponent or even multiple opponents, they must have the skills to defend themselves efficiently. Unarmed combat training teaches the soldier to fight with whatever resources they have. One of the biggest lessons we get during our training is that of aggression and technique as well as the mindset to win. 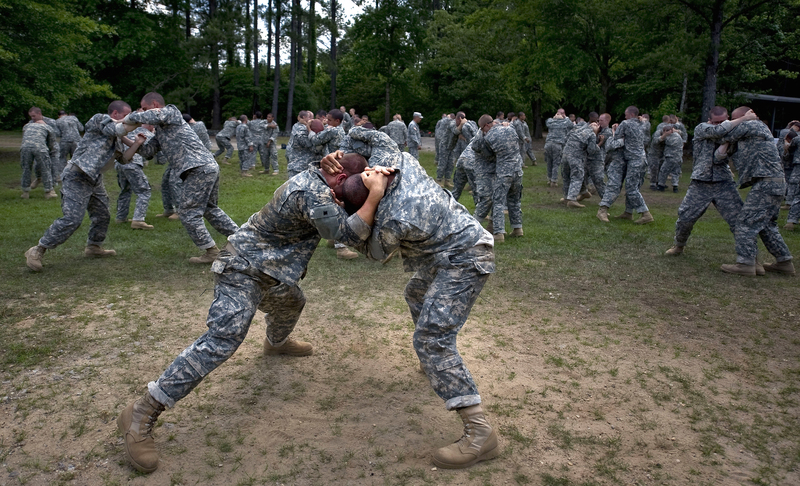 Today, Army combatives consists heavily of mixed martial arts. Soldiers use such techniques as double leg takedowns, kicks, punches, boxing, and knife fighting with a bayonet to take out an enemy. However, these techniques are not nearly enough to ensure self-defense and survival. So, army combat training focuses on survival skills too. There are no rules, no rounds, no referees, and no limits. The aim is to recover a weapon so that the soldier can survive. Every single technique and skill soldiers are taught aims to drive home the point that hand to hand combat is a last resort for survival. It is more desirable to use a weapon. Thus, the training not only focuses on body and strength but also develops the mind. Half the battle is fought and won in the mind. There’s a lot of information here, so, let me give you some pointers. Learn how to efficiently and effectively shoot a gun. Learn some real hand-to-hand combat skills — Not sports stuff, but real combat survival techniques. Prepare your body for the fight. All the skill in the world won’t help you if you run out of gas during the fight. Learn how to use a knife or stick for combat. You can legally carry a knife in most places, and you can always grab a stick to defend yourself. Learn to use improvised weapons. You can turn almost anything into an effective weapon. Learn to prepare your mind for combat. Inflicting pain or death on someone is not as easy as you might think. This is no video game. If you really want to learn how to survive like an army soldier, prepare yourself with the types of skills I mentioned here. They just might save your life. Click Here For More Survival Training By Derek Smith! Can’t argue with that… Thanks. As always very good information.THANK you. Very true. You have to know, and I mean know down in your heart of hearts, that combat is about choosing between you or them. Not both. If you can’t live with the consequences of what you might have to do, then you shouldn’t bother to kid yourself by practicing until you get over it. And that’s hard. The alternative is to learn only the containment moves like law enforcement does. The point is, you have to be not only willing but comfortable to do to another human being what you practice. And you have to sleep at night too. Oh, also just got my Striker Knife. Totally awesome, works like a charm. Why didn’t someone think of this redesign before? It’s so simple, yet so much better. Thanks! Good stuff ..wartools ..Scouts motto ..Be prepared improvise adapt and overcome..
GREAT STUFF! Really useful information. Thanks! Thanks, worth more than words can say. Need it like the air I breathe. GOD Bless!!!! This is very intresting nad important knowledge coming from the veteran. Thank you Mr. Smith! This is awesome!!! Thank you this was extremely insightful ! Are you going to put that Monster “Diamondback” Knife on the Sales List again Soon? I want one!!! Helena thank you. So glad you like it. maurice russell thank you for your kind comment. All great and valid points; especially No 7. Shooting the enemy from afar is relatively easy, but can you look someone in the eye in the instant that you are taking his or her life?!? Hell of a mindset adjustment for a civilian non-combatant with no previous military training. TOM H I don’t know your limitations so it is hard to say. Are you able to learn to shoot? I have seen some people do martial arts from a wheel chair. I have very bad knees so I cannot kick like I used to so I had to adapt. I will you the best brother. I am interested in this training. I was in the Navy from 90-98, torpedomans mate. God bless.